Why Us ? Because We Care !! INTRODUCING FIRST INSTALLATION IN DELHI NCR WORLD'S MOST ADVANCED & FASTEST LIGHT SHEER DESIRE FROM LUMENIS,U.S.A WITH HIGH SPEED (HS) & XC HANDPEICE. High-Speed Integrated Technology (HIT™) reduces treatment time by more than 75%. Using the 22x35mm spot size, large areas as the back and legs can be treated in less than 10 minutes. THE HIT ™ eliminates the lengthy preparation time need need for cooling or anesthetics. High-Speed Integrated Technology (HIT™) uses a unique vacuum mechanism that activates the skin's tactile and pressure receptors to inhibit the transmission of pain. Numerous clinical studies and peer review articles have validated the safety and efficacy of the technologies powering the LightSheer DESIRE. Thousands of satisfied customers have been and are still benefiting from the gold standard performance and patient satisfaction. Welcome to the Empathy Skin & Laser Clinic . We are committed to providing you with the highest quality of care and unsurpassed service with excellent cosmetic results at affordable prices in whole of Delhi & NCR. Our patients' satisfaction is our most important goal. Our success is a direct reflection of the amount of time, dedication, and care which we devote to our patients' needs. Our courteous and knowledgeable staff is always happy to answer your questions and assist you in any way that we can. At Empathy, we believe its important to review your progress and ensure you know how to maintain your hair-free skin. Depending on the area being treated, the process may take anywhere from several minutes to several hours to complete. The most commonly used lasers utilize a low energy laser beam. 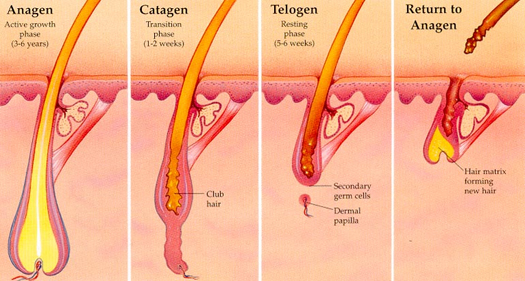 This beam passes through the patient�s skin and is attracted to the pigment of the hair. The energy passes down the hair shaft and is absorbed by hair follicles that are in the active growth phase, thereby disabling the hair follicle in the deeper layer of the skin. 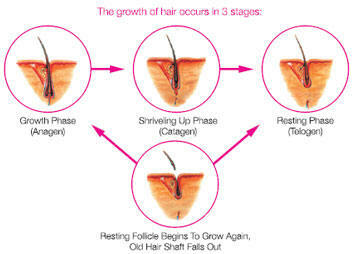 The hair follicles that are in dormant phase are not affected by the treatment. In most cases, minimal pain should be experienced and no anesthesia is required. 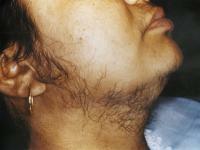 Laser hair removal works by directly targeting the follicle, where hair grows. A concentrated pulse of light is harmlessly beamed through the skin into the hair follicle. The pigment in the hair absorbs the heat and light from the laser and removes the hair follicle from its root without harming the skin surface. 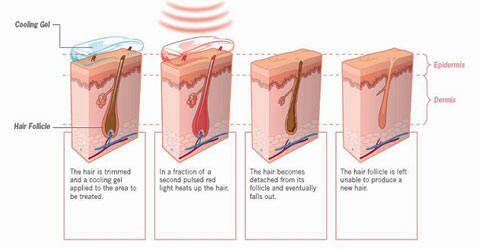 The laser beam first sources for the hair follicle by detecting its melanin. Melanin is the dark pigmentation in the hair. Then it directs the laser beam at its root to destroy it. We highly respect our customers' confidentiality. Customer information is kept strictly confidential. Customer information will not be released, shared, or compromised in any way. Laser hair removal Delhi represents a revolution in hair removal by disabling hundreds of hair follicles in seconds and by promising long lasting results. Mortifying waxing experiences. Goopy at-home creams. Last-minute bikini season shaving. When it comes to removing unwanted body hair, you�ve put yourself through the ringer. But with Empathy's Light Sheer Laser Hair Removal treatment, you�ll say goodbye to everyday shaving � and get used to skin that�s smooth and stubble-free. 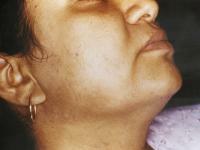 At Empathy Laser Hair Removal Clinic, we have performed several laser hair removal delhi treatments. Quite simply, we know what works � and we�re leaders in our field. Our team ensures that our methods and training programs exceed industry standards, and we�re constantly evolving to meet our clients� needs. 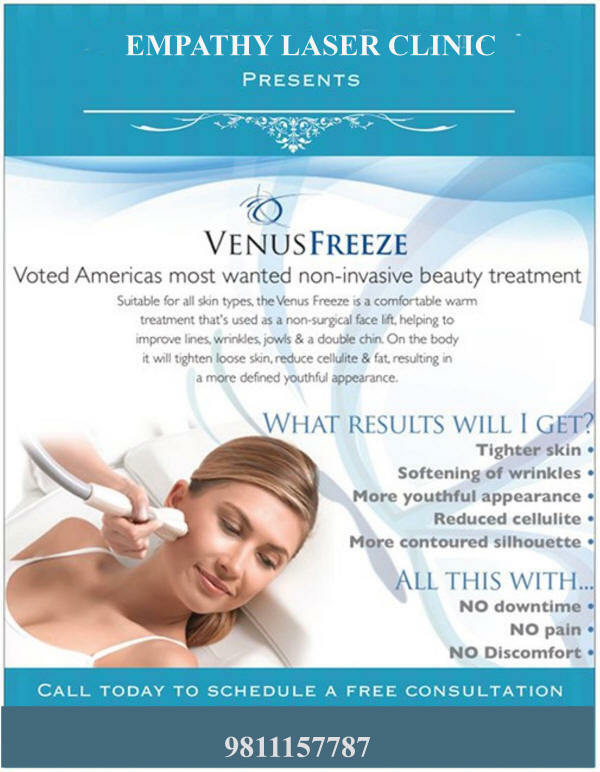 So you can be confident that you�re getting the safest, most effective treatment at the best possible value. After completing the treatment, clients describe the experience as nothing short of a lifestyle change; most can�t believe they ever spent so much time and money bothering with razors, creames or waxing. Our Light Sheer laser hair removal system uses a combination of energy and heat to destroy follicles without harming the skin around them. 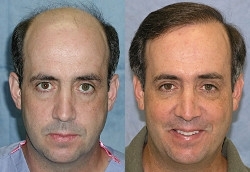 After a series of sessions, you�ll experience permanent hair reduction. Depending which area(s) you decide to treat, you�ll always be ready to slip into a swimsuit, won�t have to think about razor burn or irritation, and will stop worrying about unsightly ingrown hairs. With laser hair removal, nobody will know you�re undergoing treatment (unless, of course, you want them to). Laser hair removal sessions can be as short as fifteen minutes, and we just ask that you stay out of the sun, shave the area to be treated; and avoid using lotions, creams or products, for optimum results. Most clients describe the sensation as a mild �hot pinch,� similar to the feeling of being snapped with a rubber band. In most cases, the sensation goes away almost immediately.